He knew he'd pay a painful and expensive penalty later for the foolishness he had in mind right now, but he lifted the glass from her hand and pulled her from her stool. "Dance with me, Maggie." "Is the business phase of this discussion over?" she asked. "I don't know," he said, letting her fingers slip through his in a teasing friction. "Are you finished discussing it?" "That depends on what happens out on the dance floor." He rested his hand along the back of her slender waist and guided her toward the tiny space near the pool tables. Beneath her gauzy top he could feel the curve of her spine and the flare of her hips, and the slip and slide of the fabric over the silky, lacy thing she wore underneath made his mouth go dry. She turned to face him when they reached the center of the room and glanced up with a combination of anticipation and challenge in her eyes. From the jukebox, Faith Hill reminded him to just breathe as he pulled her close and curled her hand in his. "This is one Friday-night habit I don't mind falling into," she said as she slid her free hand around the back of his neck. "You've got some smooth moves, Hammond." "Flattery will get you once around the dance floor." She teased her fingers through the hair that brushed the edge of his collar and skimmed one of those bright red nails along his nape, and he caught his breath at the tickling sensation. "And after that?" she asked. He guided them in a slow-motion circle. "Just where do you want to take this?" "As far as it will go." His fingers tightened around hers. "You don't believe in doing things halfway, do you?" "What's the point in that?" She snuggled up against him and gave him a witchy smile. "It won't get me any place but stuck in the middle of nowhere." "Like you're stuck here in Tucker," he said, reminding them both why he shouldn't take her up on the invitation he saw in her eyes. The corners of her pretty mouth turned down in a pout. "I don't think of Tucker that way." "You don't seem to think of it as a destination, either." "What about your home, while you're here?" The song was winding down, and their steps slowed to a stop. "You can't quite bring yourself to say the words, can you?" "Why is that so important to you?" "Believe me," he said, putting another inch between them. "I don't want it to be important at all." "What do you want?" She edged in close again, those polished toenails nearly touching the tips of his boots. "Come on, Hammond. You asked me that same question not so very long ago. Now it's your turn. What do you want?" Something inside him sizzled and snapped. "This." He brought his mouth down on hers in an impatient and none-too subtle answer, a greedy gulp of a kiss. Nothing else mattered at the moment, not the witnesses in the Beaverhead, or his position on the school board, or his reputation for slow and sober consideration of the consequences of every actionactions like a public display of some mighty heated affection with another woman who'd leave him the first chance she got. Nothing else meant anything at all to him, nothing but the thrill of her hot and eager response. He raised his head and noted with bone-deep satisfaction that her eyes were clouded with desire. "Does that answer your question?" ® and  are trademarks of the publisher. 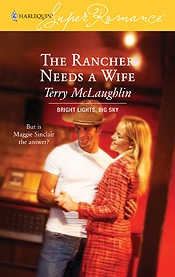 The edition published by arrangement with Harlequin Books S.A. For more romance information surf to: www.eHarlequin.com.